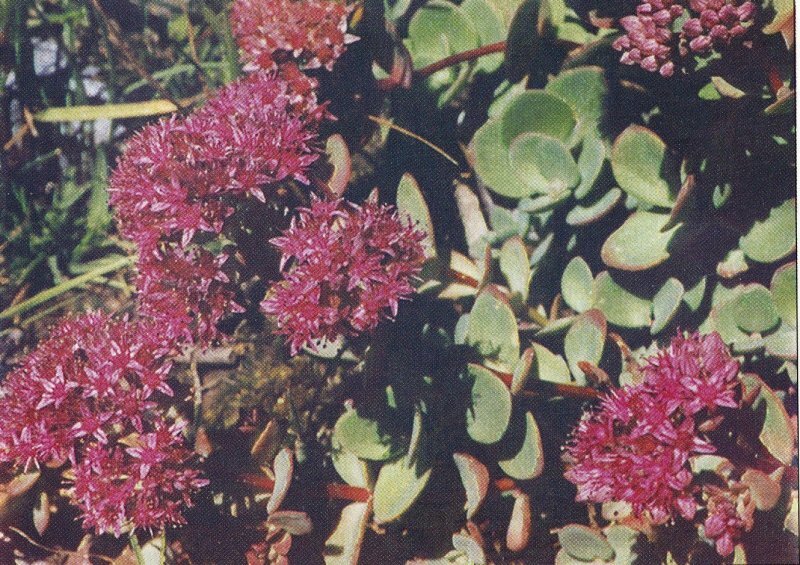 Hylotelephium H. Ohba in Bot. Mag. Tokyo. 90: 46. 1977; in J. Fac. Sci. Tokyo 3. 12: 162. 1978; Aswal & Mehrotra, Fl. Lahaul-Spiti 248. 1994; Fu Kunjun & H. Ohba in Wu Zheng-yi & P. H. Raven, Fl. China 8: 209. 2001. Annual or perennial herbs or rarely subshrubs, mostly succulent. Stem erect or ascending, creeping, branched, rarely simple, deciduous. Leaves, alternate, opposite, sessile, petiolate, simple, entire to variously toothed or lobed. Inflorescence terminal, corymbose, paniculate, racemose or cyme. Flowers sessile or pedicellate, bisexual or unisexual, small. Calyx gamosepalous, lobes fleshy, green, often reddish. Corolla polypetalous, petals membranaceous. Stamens twice as many and shorter than petals, basifixed. Nectar scales small, as many as carpels, dorsally placed on the carpels. Carpels as many as petals, basally connate or nearly free, style usually short, ovary stipitate, attenuate at the base. Fruit consists of erect follicles. Seeds few to many per fruit, small, brown, smooth to longitudinally striae. A genus of 12 species found in Central Asia. Represented in Pakistan by 2 species.